Shalom beloved friends, partners and members of the United Nations For Israel! Hoping you and your family were abundantly blessed in this recent Hanukkah season of celebrating His faithfulness to us whenever we go to battle for righteousness. He surely is able to do exceedingly abundantly above all we can ask or think – the miracle of one day’s supply of oil lasting for 8 days proves there is nothing too hard for our Yah! Our Embassy is lighting up the night in Mevaseret Zion, strategically located at the western gate of the holy city – boldly displaying flags of member nations. We hope all our UNIFY members will plan to visit and/or stay with us on your next trip to the Holy Land, to be watchmen on the wall at this historic time in which we live. Remember this is YOUR Embassy! Your continued monthly support of UNIFY will assure the success of our efforts. Also note we are scheduling volunteers to help keep operations running smoothly, under the direction of Embassy Manager Raijaliisa Ovadia. 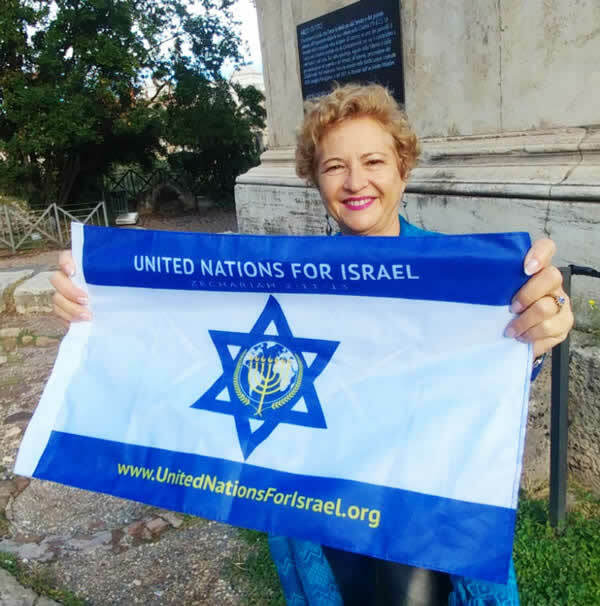 If it is your heart to serve, send your email request to: embassy@unitednationsforisrael.org. (You can also make reservations to stay with us using this same email.) 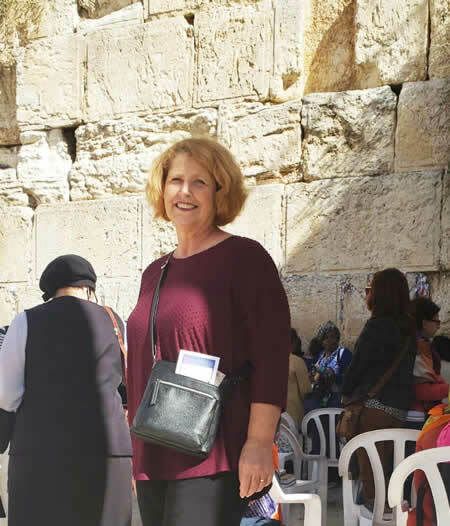 Special thanks to all our volunteers, including Pastor Cyrilla Schultz (National USA Delegate) who is currently assisting at the Embassy through February. Additional finances are still vitally needed for our Embassy (including upkeep & stocking supplies in multiple bedrooms and living quarters) – please seek the Father’s will regarding what amount we should each sow, especially as we seek to honor Him with our Holy Giving at each upcoming Feast season in 2019. Prayerfully consider joining many others as one of the 70 Righteous of the Nations, committing to faithfully give at least $100 per month. Each member and Delegate’s continued support is vitally important as the vision for establishing Sheep Nations, through our unconditional love and support for Israel, comes to pass. Please bathe our efforts in prayer as we move forward, making this strategic base of operations a place where members from all the nations can gather to be refreshed and to bless Israel in action. Most importantly we need everyone to join with one heart to accomplish what YHVH desires: to see the full restoration of Israel in our day! Therefore we fight for Israel where she cannot fight for herself in practical and in spiritual ways, in the media, social media and in prayer and strategic action such as public marches and outreaches with the UNIFY flag and emblems. 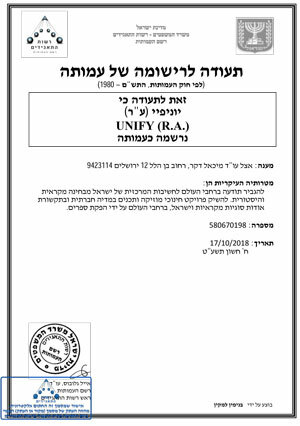 We celebrate the Amuta issued in Israel for UNIFY on October 17th, 2018! This establishes our organization as “non-profit” (like a 501©3 does in the USA). Today we went to the mall to do some shopping. As we were walking I smiled at a elderly gentleman, and he stopped and spoke to me in Hebrew. I quickly told him I only knew English, he then spoke in English. He ask, do I know you from somewhere, and I told him no. As we visited I was able to share with him that I was a volunteer at the United Nations for Israel Embassy. Then Raija Liisa visited with him in Hebrew and explained who and what we stand for. As she talked I could see his heart melt when he realized an organization like this exists here. It blessed my heart to see his heart blessed so much. We visited for quite some time and found out that he was born in Israel 80 years ago. He has been a Vet in many wars in his homeland, Israel. He was also a professor at the Bible Institute. His family name is Ellyr, and he went home from his shopping trip today blessed. Let us love Israel one person at a time. My we go forth out of this Embassy with full hearts for these beautiful Jewish people and bless them, one by one!! Praise Yah for this wonderful encounter! An offering was gathered from members and sent on November 2 in the name of UNIFY, to support Jewish families that lost their loved ones in this horrific shooting and/or for the restoration needed for their synagogue. Along with these funds we sent our heartfelt prayers in this hour of senseless violence against Jewish people in America. Thanks to all of you who contributed to this special offering. May our love penetrate deeply into the hearts of those precious souls. Read and be encouraged by the reports from various nations shared below – let each account of others spreading the news about our UNIFY mission ignite a spark within. Be inspired by the Ruach HaKodesh – and pray, asking how He may use you, right where you live. Notice how each step taken leads to another. Even if they seem small at first, Yah is always working and impacting others through us – so, step out in faith! I was invited to join a group of 5 people from different churches who meet to pray for Israel once per month. Their churches are not agreeable to praying for Israel — so they started this group to pray on their own. We pray for Israel’s protection and for the salvation of the Jews. Also after discussing what’s happening in Israel (one person collects and shares the most recent news) we pray into these issues as well. I recently introduced UNIFY to the group and asked for monetary funds, advising them that whatever I receive from them I would match and send to the UNIFY. Happily I was able to send $150 (US) to UNIFY, based on what I collected from this group – after planting the vision of Sheep Nations in their hearts. It was a delight when my church (generally not having a heart for Israel) invited a Messianic Rabbi to explain the importance of Israel to the church. I also learned a new group will be forming to pray for Canada — I will definitely join them and propose that we pray for both Canada and Israel. After an inspiring message a few weeks ago, our Pastor asked each person to pray for 2 people – one connection of mine was a gentleman who is the bookkeeper and regularly teaches inspiring messages in the church. I advised him that my prayer request included praying for our church to know the Hebrew Roots of the Faith and to walk in the Truth of the Word. Another small group joins together each Sunday before our church starts to ask the Holy Spirit to move in the service — and I always pray in the name of Yeshua. In our prayer this past Sunday (as Hanukkah began) I prayed for the church to know the importance of Hanukkah — emphasizing that Yeshua also celebrated Feast of Dedication (John 10:22,23) — and connected Hanukkah with Yeshua – The Light of the World. While progress seems slow, seeds are being planted. I continue to believe and have faith that Yahveh will open a door at the right time for me to speak and bring a message of the importance of Genesis 12:3 – The Key of Abraham. Canada will become a Sheep Nation — one person at a time, one church at a time and one city at a time. I believe that once this door is opened, I will be able to move forward as the Ruach leads. A few weeks ago, a Guest Speaker prophesied that the Church is going through a transformation. He said the Church was like a young girl before, but that it is coming into maturity. I believe and continue to pray in faith that this transformation is one that will bring the church to maturity as they embrace the True Gospel made in Zion. I have ordered some books and UNIFY pens and am praying that Abba Father will lead me to give these to specific people of influence in the church, to open the door for transformation. One of Estonian’s major Baptist churches Oleviste hosts an “Israel Evening” once a month. They do an overview on Israel’s political issues, people tell about their recent trips to the Holy Land, and prayers for Israel are lifted, among other things. The hosts know of my love for Israel and Jewish people, but have never invited me to share because of my quite radical approach against Christian pagan traditions and church holidays. Nevertheless, I have kept imposing myself every now and then, not taking “no” for a final answer. The first evening of Hanukkah YHVH gave me favor in their eyes and I was accepted to talk for 20 minutes. They expected to hear about my last Israel trip happenings, but I took most of these 20 minutes to boldly share about UNIFY and the Embassy, including the vision and mission of United Nations for Israel. And this all went out on Facebook Live! Beloveds, never accept “no” for a final answer and keep knocking on the doors as YHVH’s favor will always lead the way, if we do not lose heart. Marching for UNIFY in Guayaquil, the financial gate of Ecuador in support of Israel. In a sea of Latin American hostility against Israel they are a breath of Fresh Air! My husband and I attended the Sukkot Tour & Conference in Israel this year. I also graduated from GRM Bible School and was then sent from Yerushalayim to the nations, just like the first Apostles of Yeshua. Little did I not know that this particular act would bear such a tremendous fruit in our ministry and the nation. Since we left Israel something very powerful started to take place: YHWH called me to stand in the gap for my nation. The Father instructed me specifically to deal with the blood guilt Sweden has against the Jews. The Ruach HaKodesh (Holy Spirit) showed me the gates of Sweden and all the things that must be confessed as the sin against His Jewish People and redeemed. We travelled to all these gates and strategic places which the Father showed me, doing an act of repentance on behalf of Sweden. We blew a shofar everywhere we went with an unquestionable authority. Many satanic altars, strongholds and principalities were torn down by the power of the blood of Yeshua. The fruit has been awesome — there is a new fire and awakening going on. The atmosphere over the cities and large territories has changed. The political climate has changed. The vacuum cloud upon this nation is destroyed and there is a new openness in the Spirit. Gates of Sweden are ready to welcome the Jewish Messiah Yeshua — there is new hope for Sweden! The importance of getting rid of Replacement Theology cannot be overlooked: this is the key! I know that this could never happen if I had not been fully cleansed from RT and been sent from the Headquarters of Heaven upon the earth, Yerushalayim. I am so grateful to Archbishop Dominiquae Bierman that she has been a true pioneer in this area, impacting my life and ministry in a powerful and life changing way. Yah gave us a strategy to visit monthly at the parliament house of Finland to pray, blow the shofar, declare the word and raise up the UNIFY flag. Our most recent visit to parliament took place just few weeks ago. 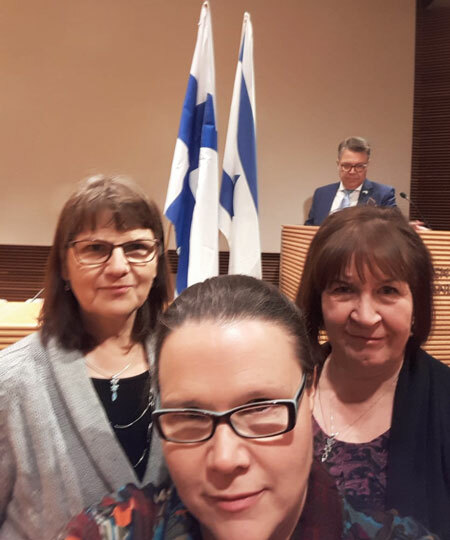 I received an invitation from Finland-Israel association to participate in a celebration at the parliament house, where the first K.A Fagerholm prize was granted. K. A. Fagerholm is an ex-prime minister of Finland and a founder of the Finland-Israel association. The prize was given to a person who has shown special friendship with Israel and who influenced Finland’s relationship with Israel. It was given to a Christian Democrat parliament member Peter Östman. We had an opportunity to congratulate him and we pray for the favor of Yah in all his work. Archbishop Dominiquae and Rabbi Baruch met him also this year in May during their visit in the Finnish parliament house (Watch the TV program of the parliament visit). After the celebration they served coffee etc. and our team was able to have conversations with other guests. Also some Finnish Jews were present and we were able to introduce United Nations for Israel organization. People were genuinely grateful and even astonished to find out that that kind of organization has been founded and exists. We shared business cards and a few small UNIFY flags. We were able to sow and share knowledge about the United Nations for Israel and expect a harvest. We will continue our monthly visits to our capital city Helsinki to pray and declare the word at the Parliament House and where ever the Holy Spirit leads us to. Praise the Living Jahve!!! Florida- Members of UNIFY, Maritza, Abraham and Paulette stood in key traffic intersections in Miami and West Palm Bay with the unfurled flag of UNIFY to bring UNIFY and Israel awareness to Florida. They were “honked” by many supporters! Report from Archbishop and Rabbi, who spent some time on a mission for UNIFY on their return from the Sukkot Tour 2018 this Fall. In Rome, Italy: Buried the UNIFY flag under the Arch of Titus (erected to commemorate the Roman destruction & plundering of Jerusalem in 70 AD, establishing Rome as the sole capitol of the world). They marched around it 7 times with a UNIFY flag unfurled, then released a shofar blast – for Yerushalayim to be reestablished as the capitol over Rome! Declared a future UNIFY headquarters to be established in Rome. 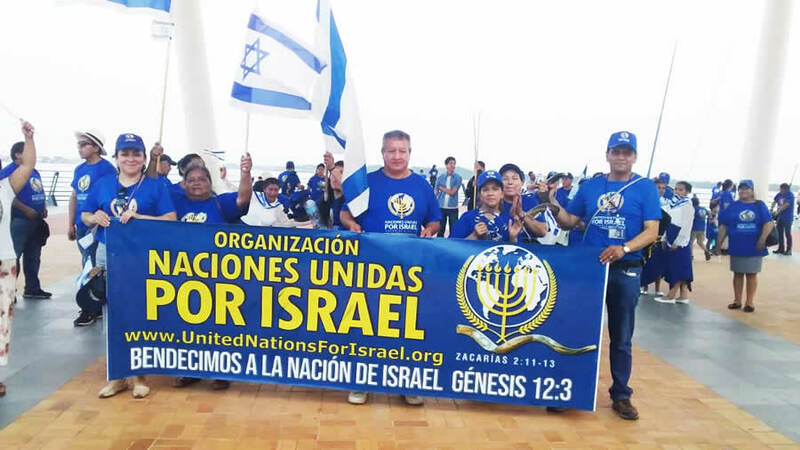 In Spain: Small UNIFY flags were planted “in strategic places” as led by the Ruach, blowing the shofar and declaring the forming of a Sheep Nation. Report from United Arab Emirates: Taking the first steps to making Sheep Nations in the Middle East – there are now 14 pastors studying the GRM Bible School! Delegates: Consider organizing a weekly Prayer Conference Call with your nation’s UNIFY members, specifically to address the unique situations facing YOUR nation. From this can birth creative strategies which can be shared. Joining hands with other UNIFY Team members in your nation can also produce greater impact at rallies, parades, etc. We are building a powerful TEAM: Together Everyone Achieves More. Other simple ways our members are spreading the message of UNIFY: Wearing UNIFY T-Shirts/hats to Shopping Mall, Supermarkets, etc. to start conversations. Sharing with people we meet about Sukkot Tour experiences. Distribution of UNIFY pens, also books and videos of Archbishop’s teachings. Plant seeds and water them with love, prayer and persistence! As every member puts their faith into action it brings us one step closer to accomplishing our mission to establish Sheep Nations – especially the Chief Sheep Nation of Israel! Sheep Nations come forth, one person at a time, as we “REEDUCATE THE NATIONS ABOUT THE GOSPEL MADE IN ZION AND THE IMPORTANCE OF STANDING WITH ISRAEL AGAINST ALL ODDS”. Remember to also take advantage of all social media outlets to share messages/videos that Archbishop Dominiquae and our Team produce. These tools can reach people around the globe at the speed of light! Our headquarters in Jerusalem to be generously supported financially & to be operated with integrity, for His glory. Also, for faithful volunteers needed for its smooth operation. February 8 thru 10 – all American UNIFY members gathering in St. Augustine, FL – to meet and strategize ways to best reach out to our vast nation. For the Uniting Nations for Israel Sukkot Tour 2019: Ruth and Naomi. 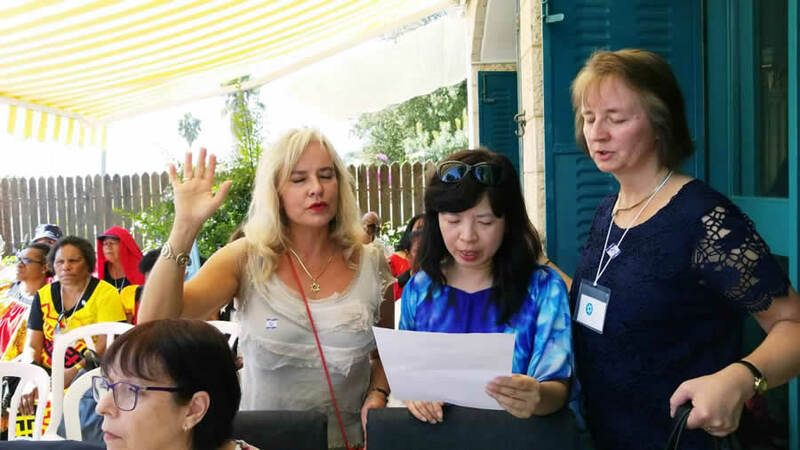 May all participants being summoned to Israel next year get prepared – each Tour is a powerful Bible School on Wheels, sure to deepen your intimacy with Yah. Believe for increased membership throughout all nations. A BIG ‘THANK YOU’ TO ALL, for your hard work & efforts to continue spreading the good news about this unique organization birthed from the heart of our Father. You are making His-story!